This is the kids game of memory, but with tunes instead of pictures. There are different sets of tunes, ranging from easy melodies to difficult sets with single tones, intervals, or rhythms. Some of them are surprisingly difficult. The game can be played with one or two players. Instead of the usual way of counting found pairs, this program takes another approach, which is only possible on computers, and makes sense in solo play. If a tune is uncovered, the computer knows if the matching tune should be known. So it counts successes or failures on this basis. If the user uncovers an already uncovered tune, and does not find the matching tune, this will always be a failure. The percentage of successes makes the score. It is possible to generate new sets of melodies, or to edit the pre-installed sets. The editor is a simple text editor, where the tunes are denoted in abc-syntax. The program comes with a complete help on this. There is a program mode, where the tunes can be tested. 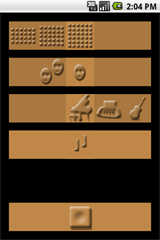 The instruments to play the tune can be selected from a range of midi instruments on the main page, or the instrument can be preselected in the text file of the set. The program is free in the Android market.